Every day Grace is required to take a nap at 1pm. Her sleeptime varies from one hour to four hours. Occaisonally she will wake up and not wish to leave the confines of her crib. She just likes to sit there for a while. I don’ know why she does that but I also don’t know why she does a lot of things – like throw all of her food on the floor during mealtime. 1.8 year olds are a mystery. Sometimes I theorize that kids her age cannot communicate and therefore are desperately lonely. Sadly they cannot express even that emotion. 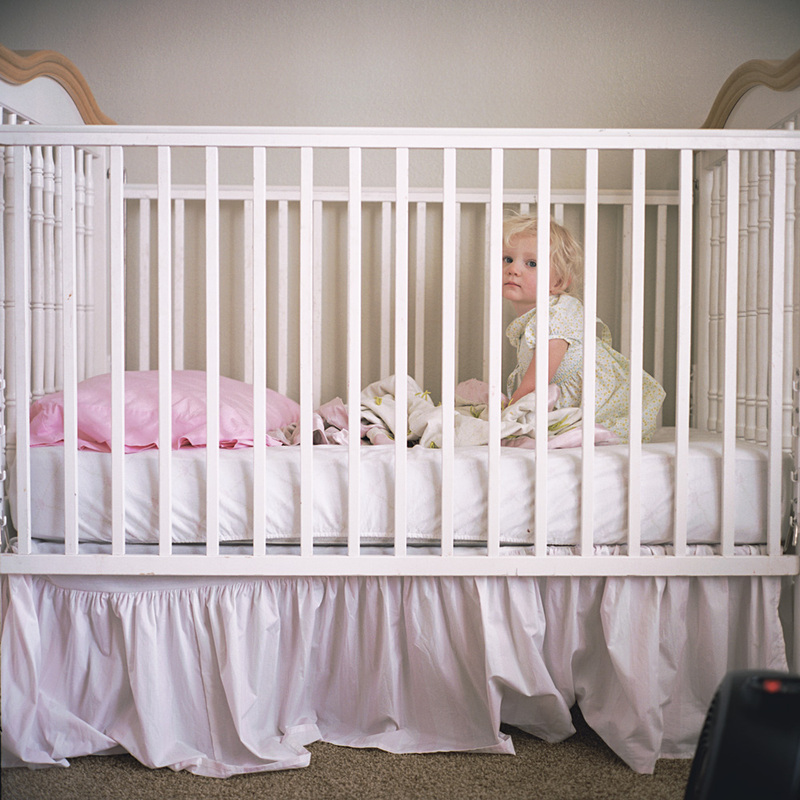 It appears from this photograph that she finds the jail of her crib comforting. It’s something that she can rely upon. It makes sense if you consider that she spends 50% of her time in there. The pillow is her new thing. She snuggles up to it. The black object in the lower right corner is a space heater. It keeps her room at a cozy 85 degrees. For her it’s like sleeping on the beach in the summertime. For me its way too hot and just taking this photograph I started perspiring. Photo tips, philosophical ramblings and technical information. The exposure on my Rolleiflex was 1/15th of a second at f 5.6. The film used: Portra 160nc. This image is the perfect example of the claim that you should be using a tripod in your photography. Why is that you ask… Well let me allucidate. First of all, indoor photography poses a difficult challenge for the photographer who desires to use natural light. Each light source is a different color..But that’s not related to the usefulness of a tripod. To capture this image I placed the camera in place to get the horizontal lines of the crib and bedskirt square in the frame. Then I spoke with her while not looking through the camera during the exposure. Truth: photographers who try to photograph their subjects while looking through the viewfinder and not at the subject are operating at a disadvantage. Try to set up the camera, focus and engage the subject without peering through the viewfinder. It is a little unnerving at first but becomes addicting because of the freedom it offers you to enhance the expression of your subject. I learned this principle while shooting 5×7 film at Charis Portraiture in the studio. You cannot look through the viewfinder with a view camera because the film holder is in the way. -Jon Ball is a professional portrait photographer who displays his portraiture at www.studiojonball.com. His photo tips are often questionable and are always presented without regard for others opinions. It’s my blog afterall.